Katie loves the new puppy. 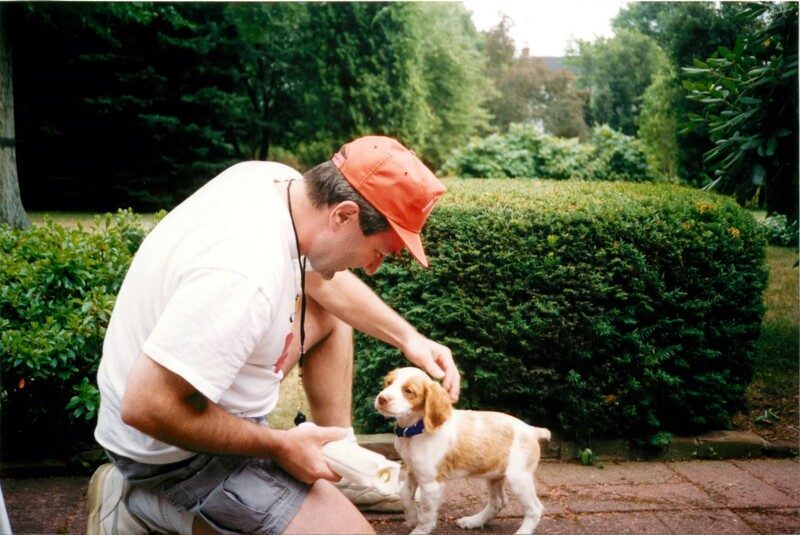 Burdock was a good puppy. He was very sweet and easy to house train. I took a week or so from work to start his training. Coworkers commented that I took more time off after getting the puppy than I had taken off when my girls were born. That may be true, but my mother-in-law didn’t offer to come over to help out when I brought the puppy home like she did when the girls came home. And while Karen had no interest in anything puppy-related, she had stopped working (outside of the home) and reluctantly picked up with puppy care when I was at work. Burdock’s arrival put a distinct chill in my relationship with my children’s mother. In fact, for the better part of a month Karen and I hardly spoke. It was a time of quiet reflection. One day, while I was at work, Karen was bringing Burdock back into the house after he took care of his puppy business and she found Maddie “choking” on a Barbie shoe. At least that is the story. Karen seemed to think it was rather thoughtless of me to expect her to watch both a two-year old and a puppy. I found it somewhat ironic that I’d get in trouble because the two-year old was chewing on things and not the puppy. Something had to give. I really liked that puppy, but I knew the children were very fond of their mother. Would it be the puppy or the wife. I considered my options. There weren’t many. I told Karen I’d get rid of the puppy. The Soviets won the Cold War. Brother Kirk gets a new pal. I didn’t feel right advertising or trying to sell Burdock. He was a very good puppy and I hated to see him go. Katie wasn’t too happy about it either. 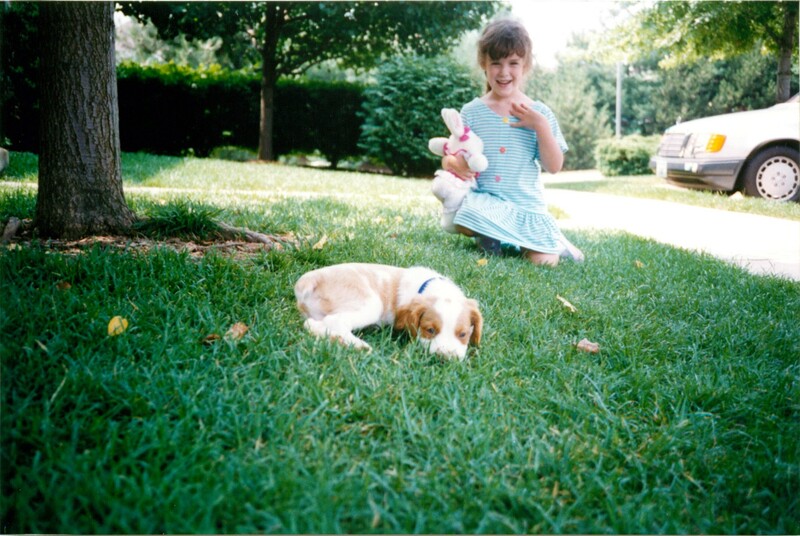 She kept reminding me, “but Daddy, I really love that puppy.” It was a fun time, really. Then I got an idea. I wondered if my brother Kirk would like a puppy. 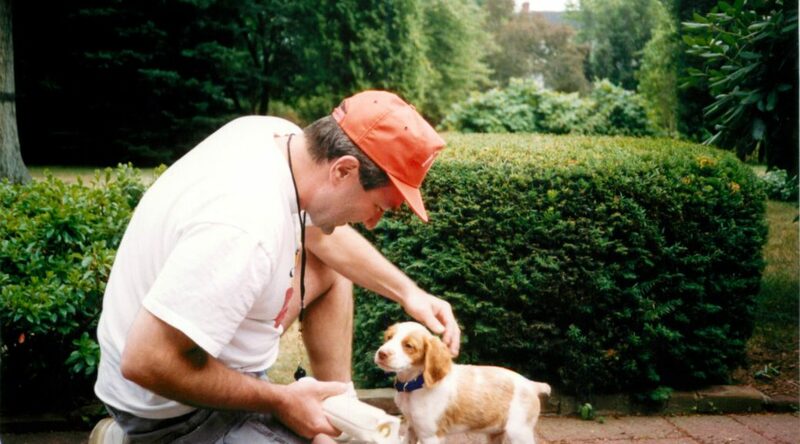 So I called up Kirk, who lived in Connecticut at the time, to see if he’d like a great little puppy. He said he’d have to ask his wife Anita. I told him that I thought it was a good idea to ask his wife before bringing home a puppy. (I may be slow, but I can be taught.) Kirk got back on the phone and said he could have the puppy, but he had to promise Anita she could have another baby. I don’t know whether that is true or not, but they did have another daughter after Kirk got Burdock. I used to tell my niece Jessica that she needed to be very nice to Burdock because she owed him a lot! We drove up to Connecticut to visit my parents and to meet Kirk to give him Burdock. Kirk said he was getting dagger eyes from Katie as he led Burdock away. Katie was certainly sad to see her puppy go, but I’m sure she never gave Kirk dagger eyes. She didn’t learn how to do that until she was a teenager.